Most little girls and little boys cherish the "teeth losing days.” Well it wasn’t quite that exciting for me when I lost my first tooth! It was accidentally knocked out! Ouch! Although not a lot of fun, what did make it a very special and memorable event was seeing what the Tooth Fairy left for me the following morning. I sure would have loved one of these adorable little guys known as Fang Dangles™ to safely place my lost tooth in while waiting for the magical fairy! Perfect for hanging on the door or bed post so the tooth fairy won't have to risk waking up the sweet little sleeping angels. 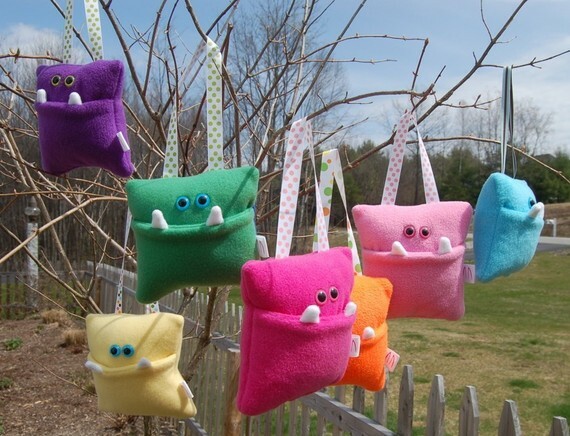 You can even choose to personalize either the Green or Orange Monster Tooth Fairy Pocket Pillow by Fang Dangles™ with your little toothless one's name! It's embroidered in a child-like "Country" font in either white or royal blue thread. Since these are all created on demand, please allow 5-7 days for creation of your unique Fang Dangles™ and another 3-5 days in shipping. And if you choose custom embroidery on the pocket pillow you will need to allow up to 3 weeks for your personalized Monster Tooth Fairy Pillow to be processed and delivered. Created by a mom herself - there's a lot of love in each little monster! Got questions? Contact us!